Basalt nonwoven materials are used as noncombustible heat insulation material in a form of basalt needle-punched mat. This product allows to realize the main advantages of the basalt fiber over the traditional fibers — E-glass and mineral wool. Basalt needle-punched mat is not impregnated with any sort of binder, but is formed by multiple needle puncturing. 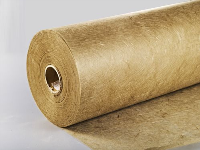 Traditional thermal insulation is made using the chemical binder, which release toxic gases during decomposition — such as phenol, formaldehyde, etc. The base material for basalt needle-punched mat is the continuous basalt fiber with monofilament diameter of 10-17 micron, whereas in other products like mineral wool the fiber diameter is 3-4 micron. Such thin materials are carcinogenic compared to fiber used in needle punched mats. Needle-punched mat does not shrink during installation and exploitation. Consequently, no gaps will appear between the insulation material and the protected surface. The mat can be easily cut, is flexible and, as a result, very easy to handle. Exploitation temperature range is from -200 deg.C to +700 deg.C . The mat is highly resistible to aggressive media. Surface veil (wet laid non-woven) weight 30 grams/sq. meter (0.88 oz./sq. yard) width 100 cm. (39.4 inches) Roll length 50 meters. Surface veil (wet laid non-woven) weight 40 grams/sq. meter (1.2 oz./sq. yard) width 120 cm. (47.25 inches) Roll length 50 meters. Basalt Chopped Strand Mat, weight 200 grams/sq. meter (5.9 oz./sq. yard). Width 100 cm. (39.4 inches) Roll length 50 meters. Basalt Chopped Strand Mat, weight 350 grams/sq. meter (10.25 oz./sq. yard). Width 104 cm. (41 inches) Toll length 104 meters.